*New images and indexes loaded for Bessemer Division back to 1965. More for Birmingham coming soon! Records created by local governments touch the lives of ordinary citizens more directly and more frequently than any other kinds of records. 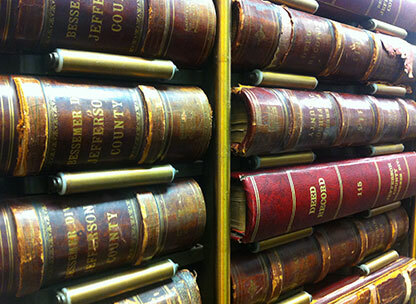 Since 1850, the Judge of Probate of Jefferson County has been the custodian of Jefferson County citizens’ records. These records contain a wealth of information for historians, attorneys, surveyors, genealogists and other researchers. See below for subscription information. Thanks to the Alabama Legislature, Jefferson County Probate Court has begun the process of archiving our oldest, most vulnerable records and documents, preserving them for the future. You will soon be able to locate your great-grandmother’s marriage license, in addition to maps and old land records dating back to the 1800’s in Birmingham and 1915 in Bessemer. For now, these older records are available for viewing at the courthouses. Probate Court’s Online Records Property Search method now utilizes faster search technology with multiple search options and new functionality called LANDMARK WEB. The LANDMARK WEB search includes real property and marriage records. LANDMARK WEB Property Records search is FREE of charge, but does require that you create, confirm, and log in to the system with a LANDMARK WEB UserName and Password to print documents. Follow the link provided below to create a LANDMARK WEB log in or to access the system with your credentials. The indexes provided are not considered the official records of the Court and are provided as a courtesy to users of the Court’s website.